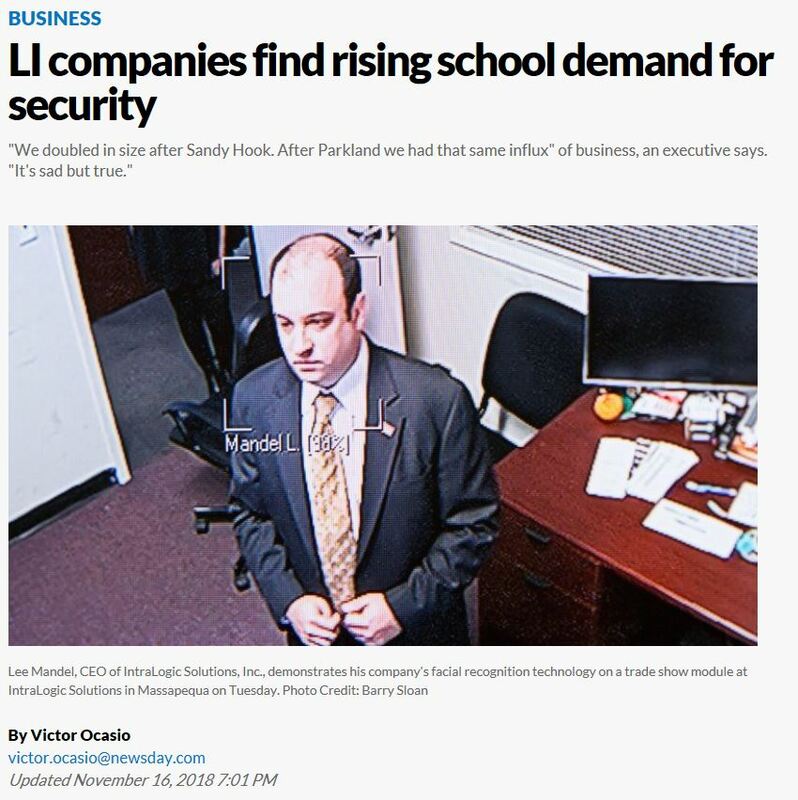 The plague of school shootings has boosted demand for security products and services from Long Island manufacturers, software developers, security installation specialists and staffing companies. High-resolution cameras, social media monitoring, remote-locking technology, shatter-resistant glass, emergency preparedness training and round-the-clock monitoring services have become increasingly commonplace here and around the country as school districts seek to prepare for worst-case scenarios of active shooters. Many local companies, large and small, said they didn’t start out in school security but were surprised and dismayed at how fast the need for protections at schools has grown. The 2012 Newtown, Connecticut, shooting at Sandy Hook Elementary claimed the lives of 20 children and 6 staff members. The Feb. 14 shooting at Marjory Stoneman Douglas High School in Parkland, Florida, claimed 14 students and three staff members. The security companies sell products that range from relatively simple and inexpensive devices, such as $100 door locks for K-12 schools that can be locked from the inside (it was previously standard for classroom doors to be lockable only from outside the room), to schoolwide lockdown systems that allow faculty and staff to lock every door, alert police and display warning messages on every screen in the building with a push of a button, starting at around $10,000 for a typical school building. Last year, the school security market represented an estimated $2.5 billion of the roughly $19 billion security industry in the United States, up from about $1.9 billion in sales in 2014, and it is projected to grow to around $3.2 billion in 2022, according to London analytics firm IHS Markit. The school security sector is larger in the United States than elsewhere, and its growth rate is expected to be stronger than other U.S. vertical markets, said Oliver Philippou, a research manager for IHS. Cheaper security equipment, government funding and other factors have helped increase industry sales, Philippou said, but school shootings are the biggest drivers of demand for new security technology in schools. 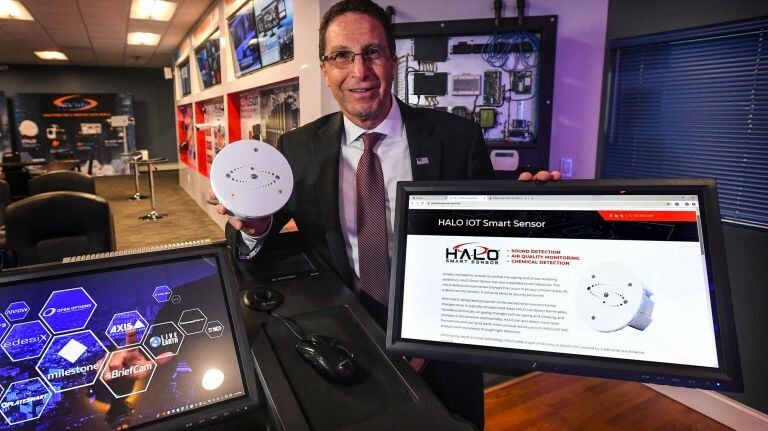 Napco Security Technologies Inc., an Amityville-based manufacturer of electronic security and “connected home” devices for homes, businesses and schools, sells its products to 12,000 distributors and security installation companies globally. Publicly traded Napco had net sales of $92 million in the most recent fiscal year ended June 30. The company traditionally sold to firms in the residential market, but it has seen a wave of interest from schools since the Sandy Hook shooting, said president and chief executive Richard L. Soloway. 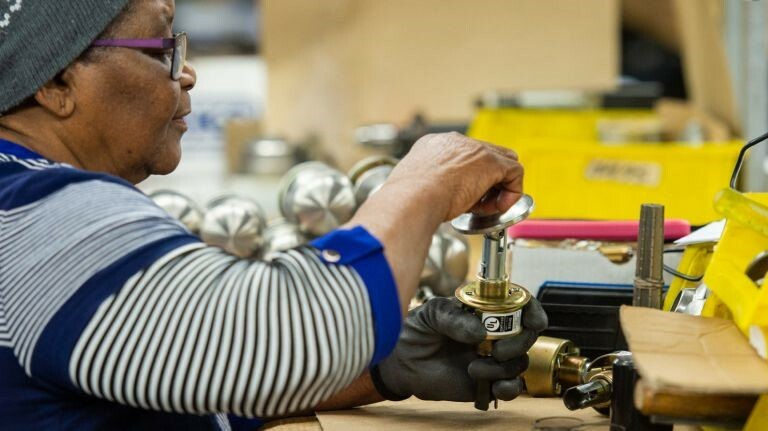 Napco began developing electronic locks — which can limit access to only those with key cards or pass codes and can even be locked remotely — over the last 10 years in response to demand from school officials and resellers. Soloway said Napco works with a variety of companies including integrators, a type of security provider that networks disparate security features — such as fire alarms, camera systems and locks — to help drive down response times in the event of an emergency. One integrator Napco works with is IntraLogic Solutions. The company sells and installs equipment manufactured by others but also develops software that allows hardware components, such as surveillance cameras, to automatically notify security personel of open doors, unusual foot traffic, or other suspicious activity as determined by “smart” algorithms. IntraLogic, founded in 2004 as an IT firm and web developer for businesses, is building a $5 million, 17,000-square-foot headquarters in Massapequa that will allow the firm to expand and demonstrate new products to potential buyers. Chief executive Mandel, 37, an accountant by training, started the business in the basement of a pasta factory. After accepting work installing cameras for private businesses and moving into security, Mandel said he started working with schools. Today, the company founder attends three to five school board meetings a week on Long Island, where he speaks as an expert on security. “I never thought schools would need this type of stuff,” said Mandel, who expects the company to generate more than $20 million in sales this year. The company has seen triple-digit growth over the last three years, with roughly 80 percent of its growth credited to the K-12 sector. “We didn’t realize there was such a huge market in school security,” he said. In the event of an emergency, responding police departments can access live camera feeds and interactive maps of a school remotely. One of the biggest advancements IntraLogic is working on, said Mandel, is facial recognition software it is installing in the Plainedge School District. The software allows school districts to identify individuals immediately, and track them from camera to camera as they move through a school. IntraLogic also runs a command center, called the Incident Awareness Center, in Massapequa. 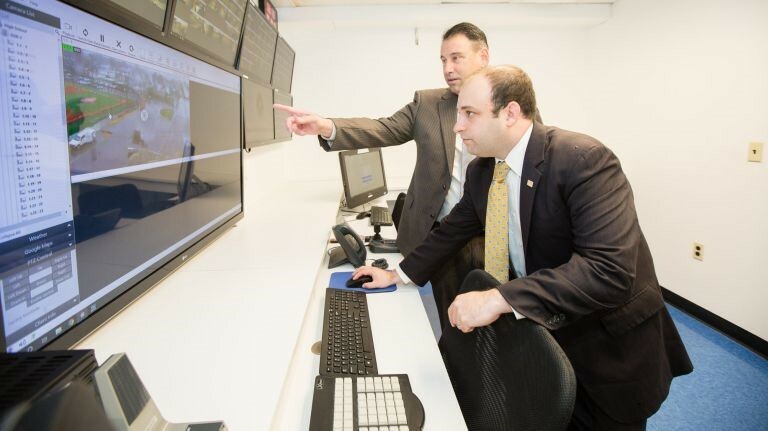 Earlier this month, staffers from Doyle Security Services, a Valley Steam-based staffer and trainer of security officers, monitored 3,000 video feeds from schools in Nassau and Suffolk counties, alerted to everything from open doors to movement in the hallways. Doyle Security has placed more than 500 officers at businesses and universities on Long Island, New York City and New Jersey. Doyle’s company has yet to staff any personnel at Long Island public schools. It’s a challenge for school districts to sift through the array of security products and services, said Carol Borow, 65, president of Hauppauge-based CHB Industries. Borow’s company, founded nearly 30 years ago, is a dealer of shatter-resistant window film. When placed over glass, the adhesive films help prevent intruders from smashing windows and entering a facility, which can be crucial in buying school occupants and first responders time. Ultimately, Borow said, CHB’s job is to supply products and installation services that help keep offenders outside long enough for potential victims to run away and for the police to respond. “It makes me cry that they have to do this, but nobody knows what’s showing up next,” she said. Officials for superintendent groups in both counties said since the 1999 Columbine High School shooting in Littleton, Colorado, in which 12 students and one teacher were killed, security measures began taking root in schools. Subsequent events have given administrators renewed urgency to make school buildings less penetrable. “We’re in the business of education and not security. But guess what? Those days are over. We have to be in both now,” said Ed Salina, superintendent of the Plainedge School District. When Salina began efforts to heighten the district’s security measures about eight years ago, the district had two security cameras. Today it has more than 400 cameras, a command center and around a dozen unarmed security guards. “We know that every second counts, and we also know this is a continued investment,” he said. For Patchogue-based BBS Architects, Landscape Architects and Engineers, security has become a major line of work. Executives with BBS, which primarily does design and engineering work for Long Island’s K-12 public schools and higher education institutions, said that while security has always been a concern in school design, it was previously geared toward thwarting vandalism or theft of property after hours. “Back 20 or 30 years ago, the focus on security was after hours,” said Frederick W. Seeba, managing partner at BBS. Today, Seeba said, the focus is on protecting students during school hours with installation of vestibules, limited use of glass, and reducing the number of entrances and exits. Additionally, Seeba said, districts have requested the design of onsite command centers and even secondary command centers to ensure that information can be sent to police and faculty in an emergency. “The parents are asking for it, and I think people now are less concerned about the aesthetics and more about the safety,” he said. At A+ Technology and Security Solutions Inc., a Bay Shore-based integrator of hardware and software security measures, educational institutions have been a business focus since the mid-’90s, said company founder and president David Antar, 63. A+ started as an IT firm in 1989, branched off into security, and today manufactures metal detectors, facial scanning devices and other security equipment and does threat assessments and training through its affiliates IPVideo Corp. and True Security Design. The company receives around 70 percent of its business from K-12 districts and higher education in the tristate region. “We’ve been doing security in schools since pre-Columbine,” Antar said. Antar said the company’s technology can be used to prevent vandalism or to identify bullying behavior. In addition, the hardware and software A+ Technology designs and sells can be deployed in reponse to an emergency. 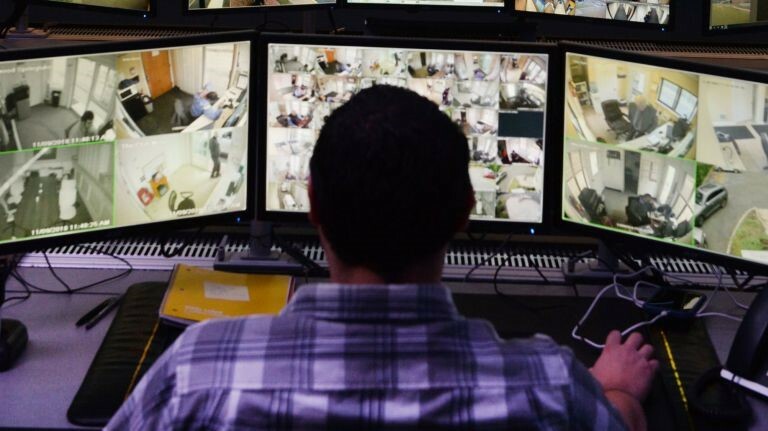 Antar’s company, which also provides round-the-clock video monitoring of schools through its network of internet-connected cameras in its “Global Fusion Center,” makes and sells a variety of devices, including less cumbersome metal detectors, face scanners, and one-button lockdown technology.